Last week I celebrated my fifteenth anniversary and I wanted to give my husband an “award” for so many years of marriage. 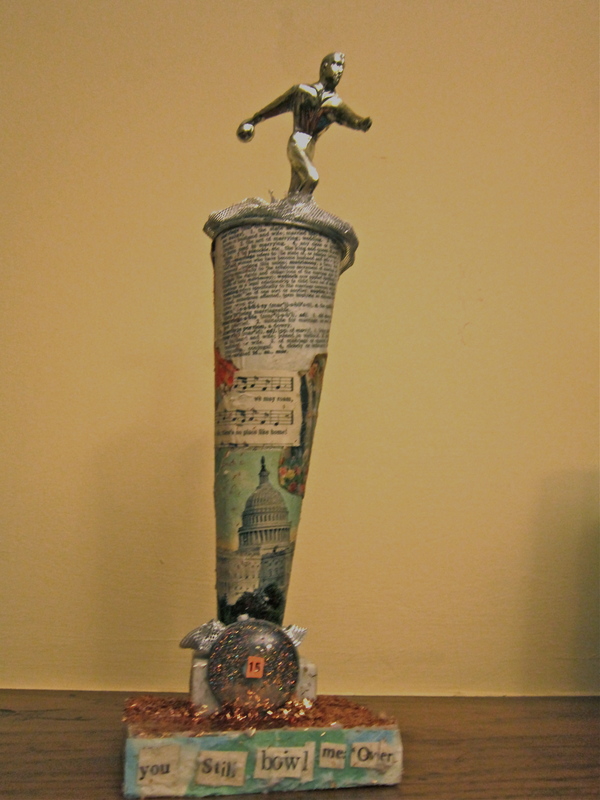 I had been thinking about refurbishing a broken trophy we picked up at Scrap DC! for a while and then noticed a couple of great stories in the latest issue of Cloth Paper Scissors on whimsical trophies and medals. My trophy, which had a marble base with an inverted megaphone column and a bowler on top, seemed like a great candidate for collage. 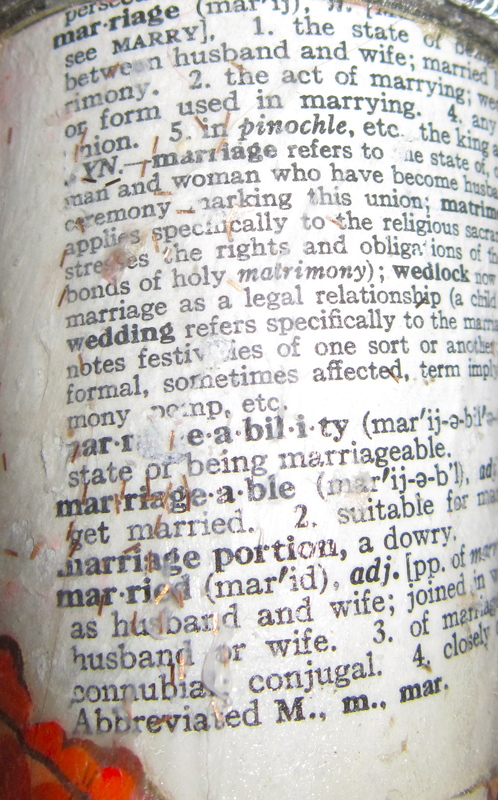 The main column combines a lot of fun things–real valentines and a definition of marriage from the dictionary, a vintage DC postcard, and other scraps that have significance for us. I coated it with several layers of mod podge, added a resin gem I picked up at a flea market, and put a tiny 15 on the gem, cut from an old Monopoly “Chance” card. 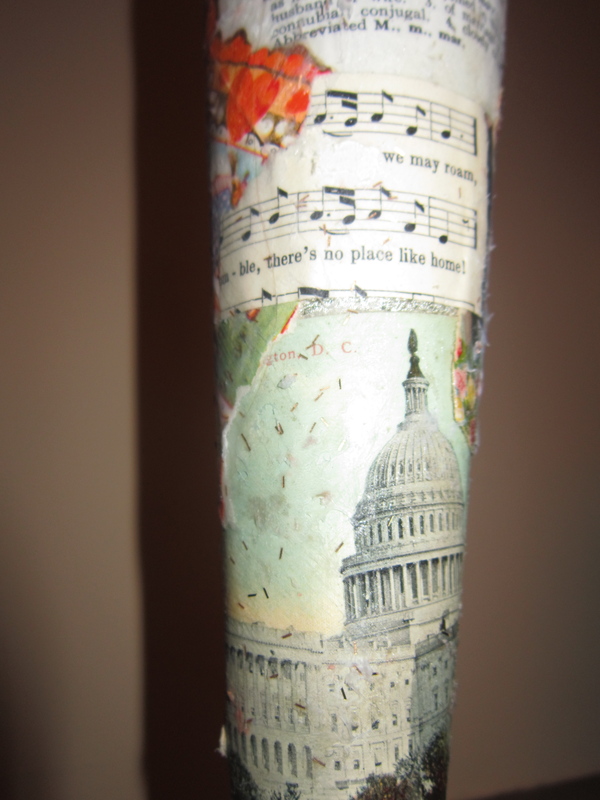 The words at the bottom of the trophy are cut from old books–I had found all of them, only to put too much gunk and glitter on top–obliterating the words and requiring me to piece them together from other words. Still the overall effect was fun and gives a nice, shabby chic feel. And the words are true–he still bowls me over after all this time!